It's thanks to three new sound-reduction features. 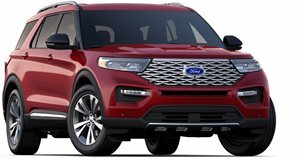 As America’s all-time best-selling SUV, the new 2020 Explorer is undoubtedly an important model for Ford. The and new powertrain options, including a powered by a 3.0-liter EcoBoost engine that’s estimated to produce 400 horsepower and 415 lb-ft of torque. Following its debut at the 2019 Detroit Auto Show, Ford has now also revealed how it made the new Explorer's interior so eerily quiet to deliver a more comfortable ride. To help reduce wind and road noise, the 2020 Explorer is also equipped with an acoustic windshield and acoustic front side windows constructed out of two layers of glass, which are separated by a thin sheet of clear plastic. In addition, Ford’s Active Noise Control uses strategically placed microphones throughout the cabin to detect unwanted frequencies inside the cabin. When these are discovered, the system cancels them out by producing opposing sound waves that come through the audio system speakers. "Think of it as thunder on a stormy night,” Lewis explained. "These sound waves bounce around us in a contained area, then the vehicle’s audio system speakers negate the thunder, essentially silencing the environment.” Strangely, however, Ford’s Active Noise Control technology is only available in the 2020 Explorer Limited Hybrid.